OFFICIAL BOOK BLURB: FBI agent Harmony Black and her team, Vigilant Lock, face a new type of threat: one from beyond the stars. They’d always heard the Red Knight was an urban legend: in 1954, three years before Sputnik launched, a mysterious satellite was sighted circling Earth, though no power on the planet had such technology. But the Red Knight is real, and what’s more, it’s inextricably linked to a supernatural force no one yet understands. Like a moth to a flame, this dark presence collides annually with the airborne satellite. Except this year the Red Knight is on course to crash-land…in Oregon. Vigilant Lock sets out to find the crash site and secure the remnants before the mysterious power is drawn to Earth. But they soon discover the mission is far from straightforward—and they aren’t the only ones tracking the Red Knight. To stop a deadly occult threat, Harmony and her team must use all their resources: technology and sorcery, science and magic. Fortunately, Harmony has only begun to discover her growing power. FORMAT/INFO: Red Knight Falling is 338 pages long divided over forty-seven chapters with a prologue, an epilogue and an afterword. Narration is in the first-person, via Harmony Black solely for the chapters and via third person for the prologue and epilogue. This is the second volume of the Harmony Black series which is a spin-off to the Daniel Faust series. April 26, 2016 marked the North American paperback and e-book publication of Harmony Black and it was published by 47 North (Amazon Publishing). Cover design is by David Drummond. OVERVIEW/ANALYSIS: Red Knight Falling is the second volume in the Harmony Black series and chronologically takes place after the events of book 1 (Harmony Black) and The Killing Floor Blues. The previous book focused on Harmony and at the same time did an admirable job of setting up the series while also giving us a detailed look into Harmony's past. This book the author decides to switch it up and gives us a look into another character's past. Who it is, I'll leave for the readers to read and find out. The story begins with an urban legend about a satellite titled Red Knight which was seen in Earth's orbit in 1954. Three years before the first official satellite "Sputnik" was even launched. The urban legend is real as our "circus team" finds out to their dismay and it's crashing somewhere in Oregon. The team is forced to scramble and try to find out who or what is causing its eventual crash. They also discover that there's something out there in space that is drawn to the Red Knight and they will have to see who or what that thing is and what is its connection to the Red Knight. Thus begins the second volume of the Harmony Black series and it is as much action-packed as its predecessor if not more. There are betrayals, double-agents and some big plot twists for the overall series. Infact one prominent big plot point is tied to something that was mentioned very minutely in the first Harmony Black volume. I enjoyed how the author made this book much different than the previous one and yet provided us with so much more. Red Knight Falling has a very adventure-thriller feel to it and this was starkly different from the horror-thriller feel of its predecessor. The plot very much feels like a James Rollins adventure thriller and Craig Schaefer makes sure that his signature touches such as multiple plot twists, a multivariate character cast and a storyline that will confound, are all present. This book also ties in nicely with a previous Daniel Faust book and it was very, very intriguing to visit those characters and locations but from Harmony's perspective. This check-in will be very much appreciated by readers of the Daniel Faust series as they get to see those characters and locations after the events of that book and will gain a deeper insight about them. This book also features Cody's return however he as a character didn't quite strike my fancy. His role though is important to the events of this book and for Harmony as well. The biggest positive about this book was all the secrets it reveals as well all showcasing how this series ties into the Daniel Faust series as well as the author's political fantasy series (The Revanche Cycle). This is the first book to make this connection such a blatantly open one. For readers who haven't read the other books/series, not to worry, it will be still be intriguing to read about. However they won't be able to make certain connections/insight that the readers of the other books will make so effortlessly. There's also the background revelations about one of the Circus team members after Harmony's turn in the first book, however their backstory doesn't quite seem as interesting. Lastly the book ends on a big, big note and I can't stress enough how much that will make you want to read the next book. The downsides though are that while this book has all the aforementioned positives but the main character on whom the spotlight is turned upon, is not as enticing as Harmony. The only other downside I could think is of is that the book kind of takes on a romantic sub-plot for one of its protagonists. This sub-plot however doesn't feel organic and seems to be attached for a specific purpose. I hope the author clarifies this situation in the third book. 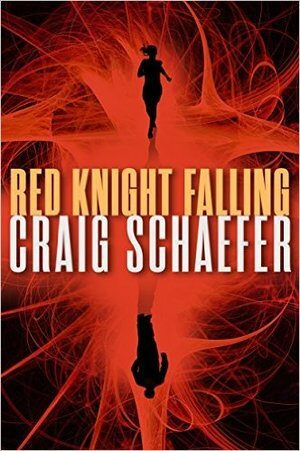 CONCLUSION: Red Knight Falling is a cracker of a sequel that takes on the positives of its predecessor and builds up on it to provide a bigger, and better read. While there are a couple downsides, they don't really detract much from the overall enjoyment. It's still a fun read that has me very, very excited for the future volumes of this series.